Mrs Foster said that if the border backstop clause is not removed from British Prime Minister Theresa May’s Brexit deal then the agreement will not get through Parliament. She was speaking after meeting the EU’s chief Brexit negotiator Michel Barnier on Thursday with a delegation that included DUP MEP Diane Dodds and Tory MPs Iain Duncan Smith and Owen Patterson. If the British government can get support for its Brexit deal before Halloween, then the UK will be able to leave the EU at an earlier date. “If they want to get a deal they’re going to have to deal with the backstop because the only thing that has got through Parliament with the majority is the fact of dealing with the backstop,” Mrs Foster said. Sinn Fein deputy leader Michelle O’Neill accused the DUP of “working against the best interests of people the party claims to represent”. 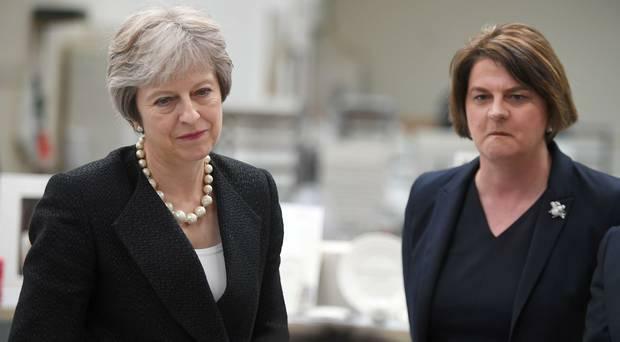 “No matter what way it is shaped the backstop is a direct attack on the bedrock of the Belfast Agreement and unless a new approach is adopted, Mrs May`s woes will continue,” Mr Swann said.